Paleontologists discovered the fossil remains of a giant lizard, Barbaturex morrisoni, which coexisted with mammals in the hot tropical forests of Southeast Asia some 40 million years ago. Some 40 million years before rock singer Jim Morrison’s lyrics earned him the moniker “the Lizard King,” an actual king lizard roamed the hot tropical forests of Southeast Asia, competing with mammals for food and other resources. A team of U.S. paleontologists, led by Jason Head of the University of Nebraska-Lincoln, describes fossils of the giant lizard from Myanmar this week in the scientific journal Proceedings of the Royal Society B. Their analysis shows that it is one of the biggest known lizards ever to have lived on land. The creature’s scientific name is Barbaturex morrisoni — which means “Lizard King,” in honor of the aforementioned Doors singer. At almost six feet long and weighing upwards of 60 pounds, the lizard provides new and important clues on the evolution of plant-eating reptiles and their relationship to global climate and competition with mammals. In today’s world, plant-eating lizards like iguanas and agamids are much smaller than large mammal herbivores. The largest lizards, like the giant, carnivorous Komodo dragon, are limited to islands that are light on mammal predators. It is not known, however, if lizards are limited in size by competition with mammals, or by temperatures of modern climates, Head said. Artist’s rendition of Barbaturex morrisoni. Credit Angie Fox, Nebraska State Museum of Natural History, University of Nebraska-Lincoln. But B. morrisoni lived in an ecosystem with a diversity of both herbivorous and carnivorous mammals during a warm age in Earth’s history — 36 to 40 million years ago — when there was no ice at the poles and atmospheric carbon dioxide levels were very high. The creature was larger than most of the mammals with which it lived, suggesting that competition or predation by mammals did not restrict its evolution into a giant. “We think the warm climate during that period of time allowed the evolution of a large body size and the ability of plant-eating lizards to successfully compete in mammal faunas,” Head said. Head worked with Patricia Holroyd of University of California, Berkeley, Gregg Gunnell of Duke University, and Russell Ciochon of the University of Iowa on identifying and analyzing B. morrisoni. It was a discovery millions of years and then a few extra decades in the making. Fossils of the giant lizard were discovered by Ciochon and colleagues in the 1970s in Myanmar, but were unstudied in the University of California Museum of Paleontology until a few years ago, when Head and Holroyd began looking into them. When Head first examined the fossils, he noticed the creature’s bones were characteristic of a group of modern lizards that includes bearded dragons, chameleons and plant eaters like spiny-tailed lizards. “I thought, ‘That’s neat. 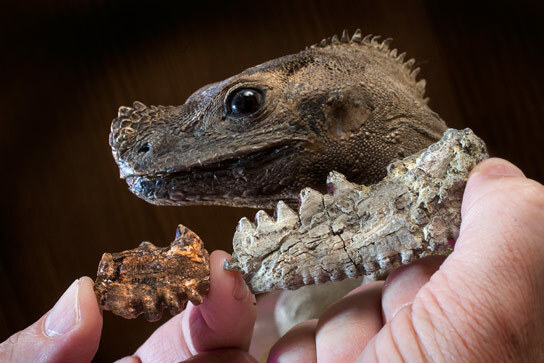 Based on its teeth, it’s a plant-eating lizard from a time period and a place from which we don’t have a lot of information.’ But when I started studying its modern relatives, I realized just how big this lizard was. It struck me that we had something here that was quite large — and unique,” said Head, an assistant professor of earth and atmospheric sciences at UNL and a curator in the University of Nebraska State Museum of Natural History’s Division of Vertebrate Paleontology. Head said the discovery of B. morrisoni now leads to other big questions: For how long do these giant lizards persist in the fossil record? How far and wide did they disperse across the planet? What are the relationships of the evolution of reptile body sizes to changes in global temperature throughout history? And the obvious question — does a warming climate mean giant reptiles will someday return? He said if we were to raise global temperatures at a natural pace and preserve natural, healthy habitats, we could end up with the evolution of giant lizards, turtles, snakes and crocodiles. “But we’re changing the atmosphere so fast that the rate of climate change is probably faster than most biological systems can adapt to. So instead of seeing the growth and spread of giant reptiles, what you might see is extinction,” he said. Meanwhile, the researchers will consider how the clues provided by B. morrisoni can be used to reconstruct global temperature over geologic time periods. 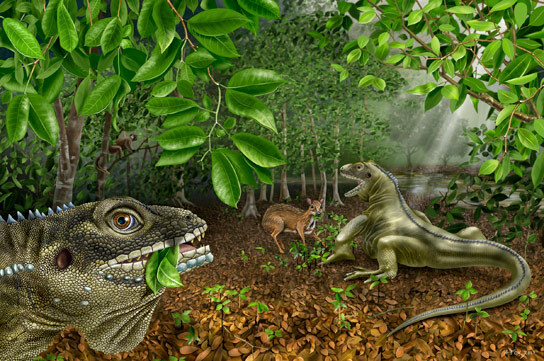 2 Comments on "Fossil Discovery Shows Giant Reptiles Coexisted with Mammals"
If crocodiles and giant reptiles of Pacific islands can exist today , it is possible for the hangover of giant reptiles of 60 million years ago, could survive along with their later cohabitants of mammals. Thank You.